Starring Scarlett: Round 8 - Finally! 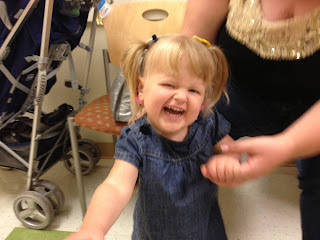 Today Scarlett got the first dose in the final round of chemo! Just a few weeks away from chemo freedom! Front row seat at the clinic TV. 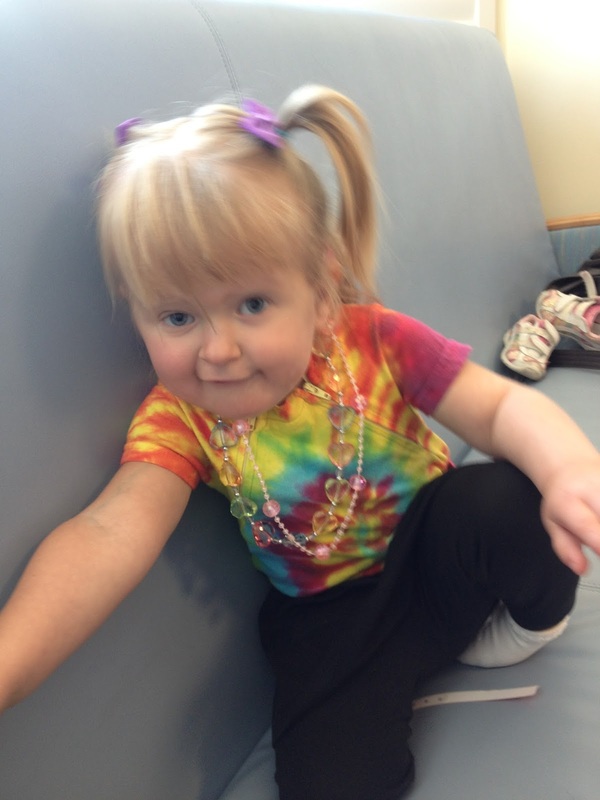 Necklaces and pigtails are the chemo uniform. It has been almost a month since her last dose, when it should have been 2 weeks. Her counts bottomed out, and we had to wait for her body to decide it could handle another round. Her labs were drawn several times over the last week, always showing very low numbers. After 4 draws with low counts, her doctor decided to just wait a full week, give her (and us) a break, and wait to start on our "regular" chemo Friday. Today, her counts we back into an acceptable range, so it was time to hit her again. We had mixed feelings - glad to get a start on this last round, but not looking forward to making her sick. 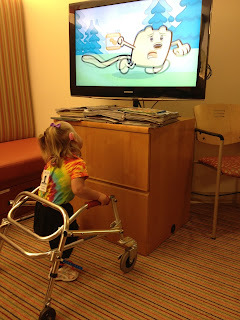 After entertaining all the nurses and doctors in the clinic, she got hooked up. 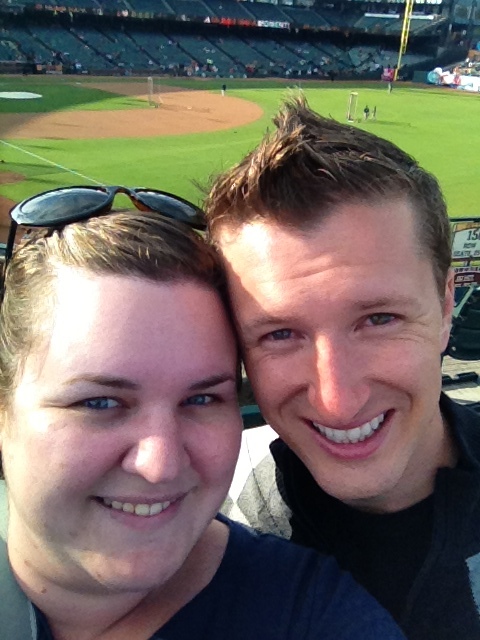 Just a few minutes in, she was already sick, and the evening went downhill from there. What a bummer. Just have to keep remembering: this is it. Never again. When the neuro doctors saw this, they said seizures without hesitation. We first thought seizures, and started anti-convulant medications, but after a few weeks, we noticed that she could easily be "pulled out" of an episode with a little pinch on the leg or a loud sound. If she can control it, it is not a seizure. We then backed off the meds, and moved up the appointment with the eye doctor. Now that we have ruled that out, the ophthalmologist says she needs glasses with no doubt...so we'll see. I joked that if we had shown it to the GI doctor, they would have thought it was acid reflux or something; every specialist sees their own worries. Nevertheless, she will be getting fitted for glasses, and we will be trying to figure out how to keep glasses, hearing aids, ankle braces, and a walker all coordinated. 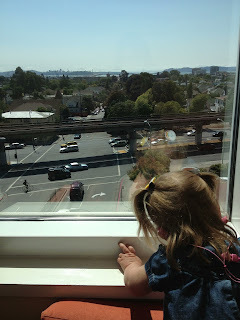 The second visit of yesterday was to her neurosurgeon in Oakland. Unfortunately, it was a long drive in traffic, so she was pretty crabby (ok, no lie - we were all pretty crabby after the glasses revelation on top of the long drive). We typically would have spaced the appointments, but both are hard to schedule, and with school starting in a few short weeks, we were running out of time. Of course, we forgot to get a disc of her recent MRI for the surgeon to see, so he really just felt her head, asked how she was doing...and how quickly he will be able to get her in for surgery again. Yup. 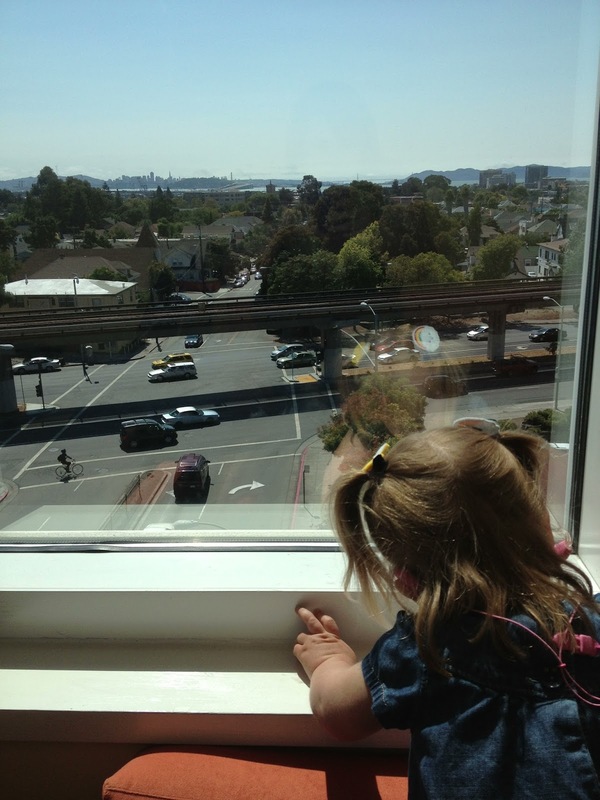 Checking out the view from the neurosurgery clinic - a lovely panorama of San Francisco and the Golden Gate Bridge off in the distance. It's the bonus for having the doctor on the top floor! Like before, she needs a solid 4-6 months off chemo before a major surgery. So, in 6 months, we will go back to the surgeon, and it will be time to schedule her next cranioplasty to continue attempting to repair her skull where previous surgeries have damaged it. The last surgery was 14 months ago, and it is pretty obvious that the surgeon's attempt to give her skull a chance to repair itself with what was there has failed, so it will be time to look at some kind of implanted skull device. And, since she will only be three, and her skull will have years of growth ahead of it, it will not be the last surgery. So, two bummer days. We're skipping swimming lessons tomorrow, too, since she feels so yucky today. The best news we've gotten is that she continues to grow: over 25 pounds again, and 34 inches tall! Mommy and daddy's getaway to the SF Giant's game at AT&T Park - bad day for the Giant's but a fun day for us! Best glasses for kids, any kids, are Miraflex. My 5 year old has had them since he was 2. They are very flexible and have an elastic strap to help hold them on. They also come in lots of fun colors, and they are less expensive than some other options. Hope this makes things a little easier on you. Scarlett will look adorable in glasses! @Tamson: All of her doctors agree! That was the only option they wanted us to consider, really, so we are going to try them on Monday. Thanks! So much for all of you to endure. Praying the glasses work and Scarlett heals quickly from this last chemo session. What is on Scarlett's back in the "Front row seat at the clinic TV." photo? Is it an ID card with Chris' picture so that the clinic knows who belongs to the kid? Hugs & strength, y'all are incredible! Aloha! @Natasha - yes! Everyone gets a badge at the security entrance. Kids get a badge with the face of whoever brings them in. She pulls them off of us all, so we put hers on her back. I usually find them stuck on the stroller seat or in her clothes. Could she be reacting to a wonky sound from her hearing aid?